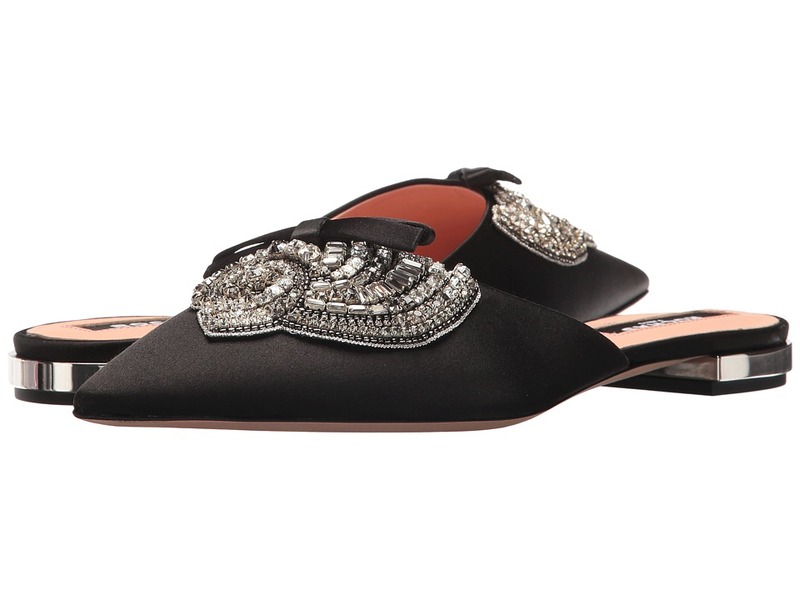 Entice those around you with your pure beauty wearing the Rochas flats. Rose printed textile upper. Ankle strap with adjustable buckle closure. Pointed-toe silhouette with bow accent. Leather lining. Lightly padded leather insole. Small stacked heel. Leather outsole. Made in Italy. This item may ship with an attached security tag. Merchandise returned without the original security tag attached or a damaged tag may not qualify for a refund. Measurements: Heel Height: 3 4 in Weight: 6 oz Product measurements were taken using size 39, width B - Medium. Please note that measurements may vary by size. Weight of footwear is based on a single item, not a pair. 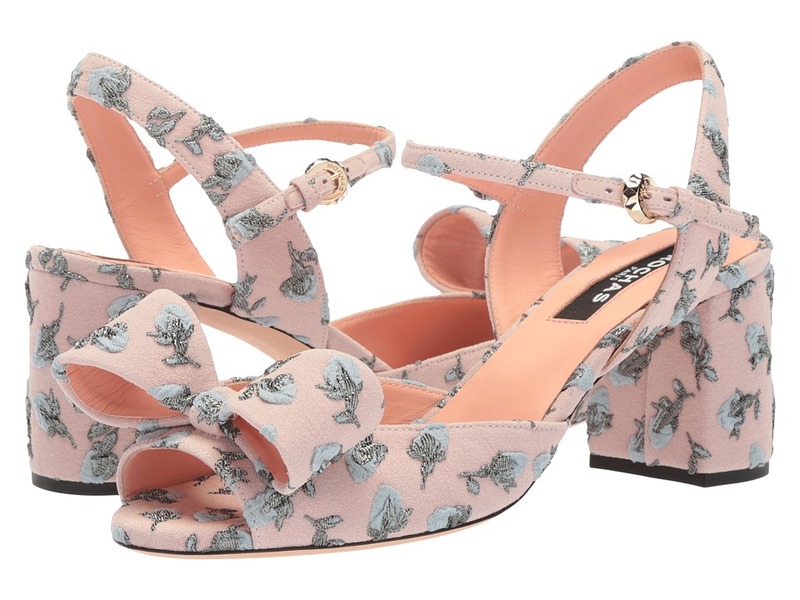 Express your penchant for all things precious and pretty wearing your Rochas heels. Embroidered textile upper. Ankle strap with adjustable buckle closure. Open-toe silhouette with bow detail. Leather lining. Lightly padded leather footbed with embossed brand logo. Wrapped chunky heel. Leather outsole. Made in Italy. This item may ship with an attached security tag. Merchandise returned without the original security tag attached or a damaged tag may not qualify for a refund. Measurements: Heel Height: 2 1 2 in Weight: 8 oz Product measurements were taken using size 38, width B - Medium. Please note that measurements may vary by size. Weight of footwear is based on a single item, not a pair. Take your style to new heights with the help of Rochas footwear. Elegant satin upper. Slip-on construction. Pointed-toe silhouette with bow and rhinestone accent. Smooth leather lining. Lightly padded leather footbed with embossed brand logo. Wrapped low square heel. Durable leather outsole. Made in Italy. This item may ship with an attached security tag. Merchandise returned without the original security tag attached or a damaged tag may not qualify for a refund. Measurements: Heel Height: 3 4 in Weight: 7 oz Product measurements were taken using size 39, width B - Medium. Please note that measurements may vary by size. Weight of footwear is based on a single item, not a pair. Express your penchant for all things precious and pretty wearing your Rochas heels. Python embossed leather and sequin upper. Ankle strap with adjustable buckle closure. Open-toe silhouette with bow at the back. Leather lining. Lightly padded leather footbed with embossed brand logo. Wrapped chunky heel. Leather outsole. Made in Italy. This item may ship with an attached security tag. Merchandise returned without the original security tag attached or a damaged tag may not qualify for a refund. Measurements: Heel Height: 2 1 2 in Weight: 10 oz Product measurements were taken using size 39, width B - Medium. Please note that measurements may vary by size. Weight of footwear is based on a single item, not a pair. 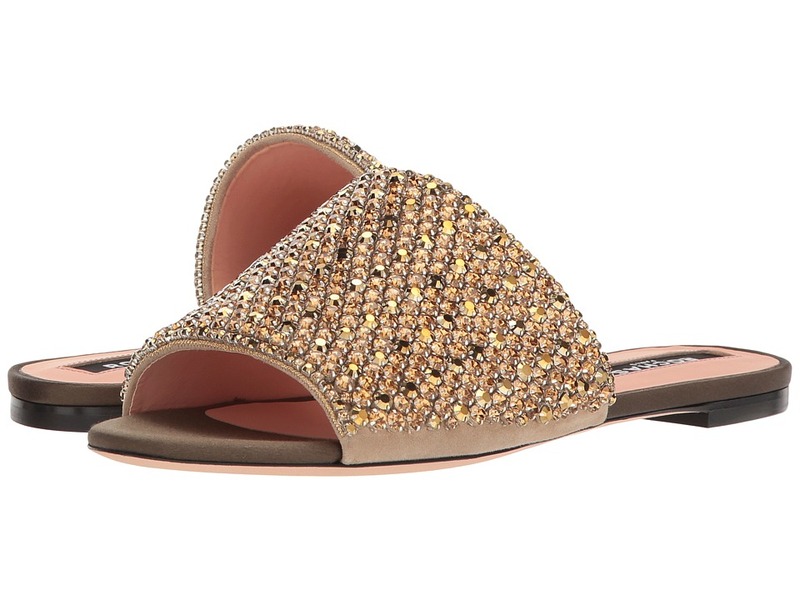 Express your penchant for all things precious and pretty wearing your Rochas slides. Leather upper. Slip-on design. Open-toe silhouette. Leather lining. Lightly padded leather footbed with embossed brand logo. Rhinestone encrusted heel. Leather outsole. Made in Italy. This item may ship with an attached security tag. Merchandise returned without the original security tag attached or a damaged tag may not qualify for a refund. Measurements: Heel Height: 2 1 2 in Weight: 9 oz Product measurements were taken using size 38, width B - Medium. Please note that measurements may vary by size. Weight of footwear is based on a single item, not a pair. Express your penchant for all things precious and pretty wearing your Rochas slides. Textile upper covered in faceted rhinestones. Slip-on design. Open-toe silhouette. Leather lining. Lightly padded leather footbed with embossed brand logo. Small heel. Leather outsole. Made in Italy. This item may ship with an attached security tag. Merchandise returned without the original security tag attached or a damaged tag may not qualify for a refund. Measurements: Heel Height: 1 4 in Weight: 9 oz Product measurements were taken using size 39, width B - Medium. Please note that measurements may vary by size. Weight of footwear is based on a single item, not a pair. 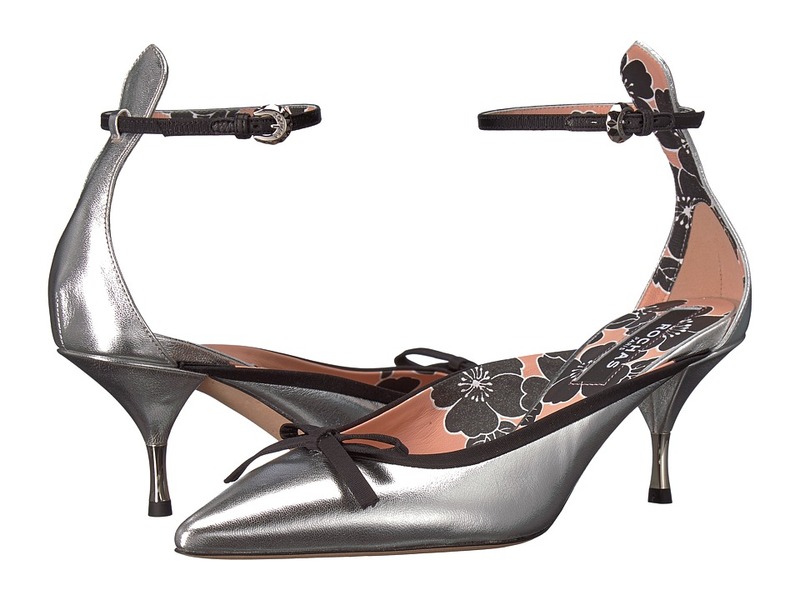 Entice those around you with your pure beauty wearing these Rochas Mules. Metallic leather upper with grosgrain trim Halo style ankle strap with adjustable buckle closure. Pointed-toe silhouette with bow accent. Leather lining. Lightly padded leather insole. Wrapped kitten heel. Leather outsole. Made in Italy. This item may ship with an attached security tag. Merchandise returned without the original security tag attached or a damaged tag may not qualify for a refund. Measurements: Heel Height: 2 3 4 in Weight: 7 oz Product measurements were taken using size 39, width M. Please note that measurements may vary by size. Weight of footwear is based on a single item, not a pair. 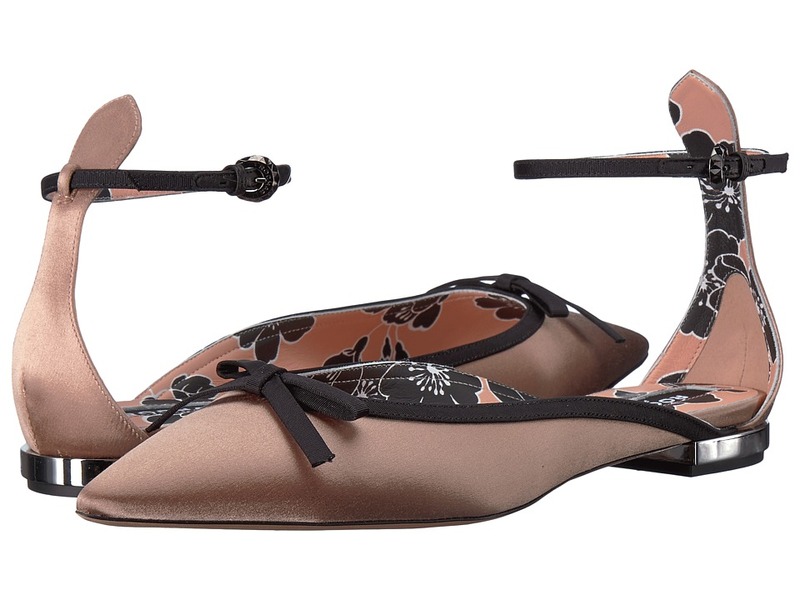 Entice those around you with your pure beauty wearing the Rochas flats. Rich satin upper. Ankle strap with adjustable buckle closure. Pointed-toe silhouette with bow accent. Leather lining. Lightly padded leather insole. Small stacked heel. Leather outsole. Made in Italy. This item may ship with an attached security tag. Merchandise returned without the original security tag attached or a damaged tag may not qualify for a refund. Measurements: Heel Height: 3 4 in Weight: 7 oz Product measurements were taken using size 39, width M. Please note that measurements may vary by size. Weight of footwear is based on a single item, not a pair. 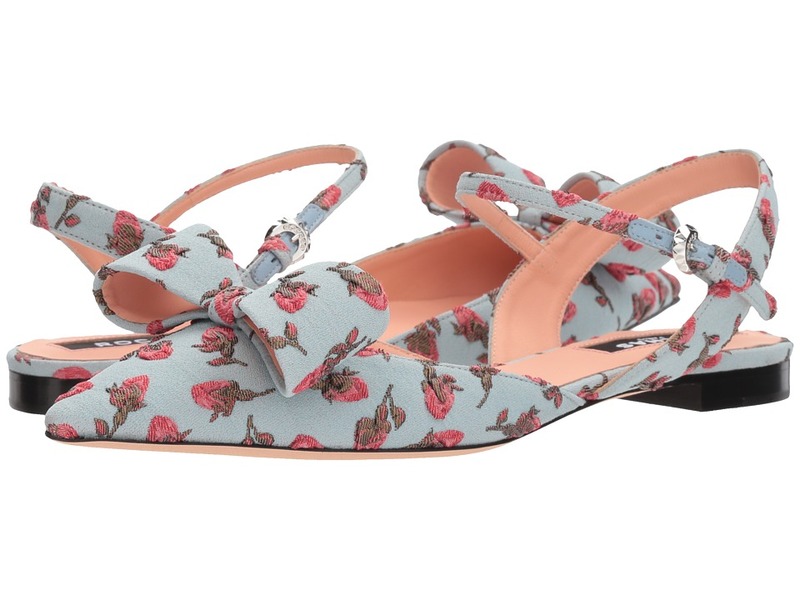 Express your penchant for all things precious and pretty wearing these Rochas Flat Sandals. Textile upper covered in faceted rhinestones. Bow accent at the vamp. Slip-on design. Open-toe silhouette. Leather lining. Lightly padded leather footbed with embossed brand logo. Small heel. Leather outsole. Made in Italy. This item may ship with an attached security tag. Merchandise returned without the original security tag attached or a damaged tag may not qualify for a refund. Measurements: Heel Height: 1 2 in Weight: 6 oz Product measurements were taken using size 37.5, width M. Please note that measurements may vary by size. Weight of footwear is based on a single item, not a pair.